Having bit of a problem with the hydraulics on my TE20. The lever on the right to raise and lower the hydraulics springs back up and wont stay down. When I drained the oil from the bolt on the front right side of the transmission there was a pop and the oil squirted out. Not sure if it's suppose to do that. Note I was also draining the oil from the main bolt at the bottom of the transmission and the left rear side bolt. I checked to see if the control valve is stuck and it seems to be moving freely. the interesting thing is that when I move the lever down to drop the implement the forks pivot at the join more than they pull back (if that makes sense). I tightened up the disk on the lever also and that did the trick to keep the lever down but the implement still wont drop. I loosened the nut on the right front side of the tractor and the bolt popped out and oil squirted everywhere and the implement dropped. I started the tractor up again, the implement stayed dropped but after a while it raised again gradually on its own about 15 inches and stopped at that height. There is a cork friction disc on the control lever assembly. It may be either worn or needs to be tightened. Sounds like a stuck control valve. Remove the inspection plates and with the motor OFF see if you can move the vertical (hydraulic fork) arms fwd and aft. 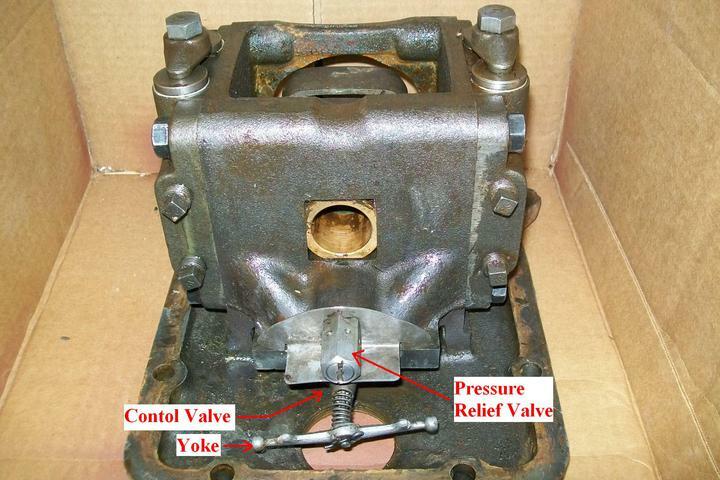 They are connected to the control valve.